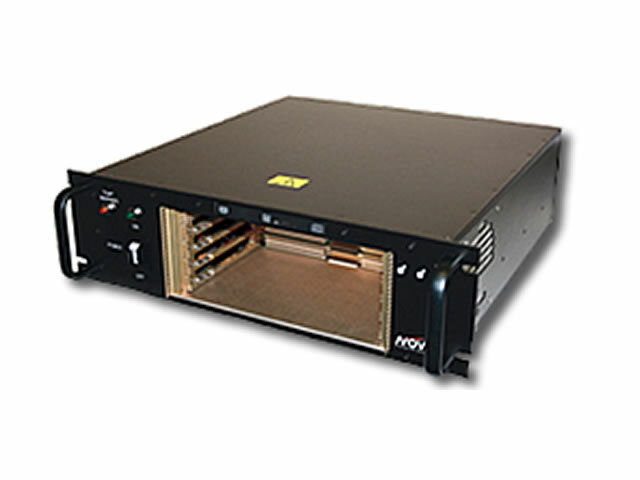 The Nova Integration Solutions (NIS) Class 4400 Industrial Grade Chassis contains a full portfolio of rackmountable and convection cooled designs from 1U in height to 12U. These chassis reference designs accommodate popular backplane types including 3U and 6U form factors of VME, VME64x, VXS, OpenVPX, CompactPCI, or VPX as well as PICMG passive backplanes or commercial style motherboards such as ATX. Pulling from the military product lines, these industrial chassis have features such as field replaceable fan trays with an MTTR of <2 minutes, extensive use of captive hardware and an optional System Environmental Monitor. Peripherals such as hard drives or I/O panels can be added to any model for added functionality. An Optional Slim Line DVD Drive is shown in the product photograph. TMP Series Industrial-grade Power Supplies, provided by parent company Technology Dynamics, are used on all Class 4400 Chassis and range from 450W to 1kW. These modular power supplies are fully configurable per application and provide an excellent balance between cost and performance. Customization is available on all Class 4400 models. Please contact NIS with your unique requirements! Model 4401 1U Coming Soon! Model 4402 2U Coming Soon! Model 4404 4U Coming Soon! Model 4405 5U Coming Soon! Model 4406 6U Coming Soon! Model 4407 7U Coming Soon! Model 4408 8U Coming Soon! Model 4409 9U Coming Soon! Model 4410 10U Coming Soon! Model 4411 11U Coming Soon! Model 4412 12U Coming Soon! -1,000 ft. to 10,000 ft.
-1,000 ft. to 40,000 ft.